My family moved to Oklahoma when I was nearly three years old. My dad was a drunkard and my mother not far from that. The church people from Windsor Hills Baptist Church started coming by and inviting my sister and me to ride the church bus. I don’t know exactly when we began riding the bus; however, when we did, the Lord began using me to speak to my mom’s heart. We would come home from church singing the bus songs, which made an impression on my mother. She eventually would come and get saved. My dad on the other hand hated it all. Nevertheless, my mother was faithful and two years later my dad came to church and walked the aisle and got saved. I had the most wonderful privilege to grow up from then on in a Christian home, Christian school, and then God called my dad into the Prison Ministry. I strayed from God in my early adult years. 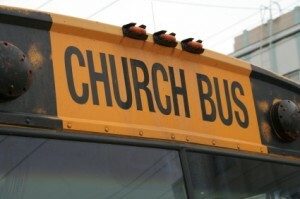 It is my love for the bus ministry that had a part in me getting right with God and serving him now. I am now the Bus Director at Longvue Baptist Church in Fort Worth, Texas where I continue to work hard bringing families to Christ like that bus captain did for our family. I’m Russell and I’m a bus kid.